We often face the situation where we need to rename the database. Think about situation, you are working as SQL Server developer for Financial firm and they have the database name TechBrothersIT and they would like to rename to Techbrothers. You need to provide the scripts that can be run in QA, UAT and Production environment. Renaming database is very easy, you can simply Right Click on Database and then choose Rename. You will see that the name of database will prompt you for change. Go ahead and change it and hit Enter. 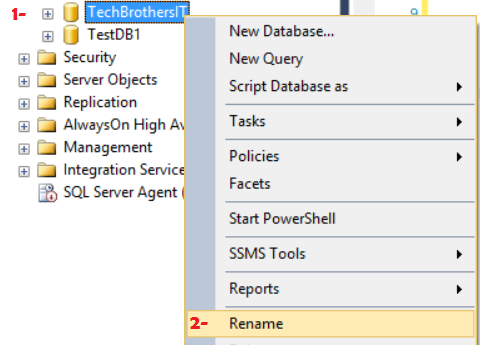 You can use TSQL To rename database in SQL Server. We can use sp_rename system Stored Procedure to rename database in SQL server. Let's say we would like to rename TechBrtohersIT to TechBrother. We can use below script. We can use below script to rename. In this example, I am renaming TechBrothersIT To TechBrothers. Let's say that the database is in use by different applications. you might get below error. In this case, you can kill all connections before you run rename script. Below script can be used to kill all connections on a database.Make sure with your team and other teams before you kill all connections on database for renaming.